The Mother of God is lying on her deathbed in the midst of the apostles. The moment of bodily assumption is shown at the top of the icon where the Mother of God is seated on a throne in the “mandorla” the angels are carrying towards heaven. The icon has two axes which form a cross. The horizontal axis is the body of Mary. Christ, standing, is the vertical axis, which indicates his triumph over death. Christ is surrounded by a “mandorla”. He is holding in His arms a small figure of a child clothed in white and crowned with a halo: the “all-luminous soul” that He has just gathered up. Christ in glory is receiving in His arms the soul of His Mother. The multitude of angels present at the Dormition forms an outer border around the “mandorla” of Christ. At the top, in the sky, the moment of the miraculous arrival of the apostles, assembled from the ends of the earth, is shown. The 12 apostles are standing around the bed in deep sorrow. The apostles assembled represent the total consensus of the Church about the veneration which the Church renders to the Mother of God. The Church as always celebrated and venerated the resurrection and assumption in glory of the Mother of God. Two bishops with haloes stand behind the apostles: St. James, the first bishop of Jerusalem and Timothy. The women represent the faithful of Jerusalem, who, with the bishops and the apostles, form the inner circle of the Church in which the mystery of the Dormition takes place. The first feast of the liturgical year is the Nativity of Mary (September 8) and the last feast of the church year is the Dormition (August 15). There are no relics of the Mother of God. This confirms what the Church has always kept in its Tradition: that Mary ascended to heaven with her body. We do not know the time or place of Mary’s death. There are two traditions: one, she died in Jerusalem; the second, she died in Ephesus. 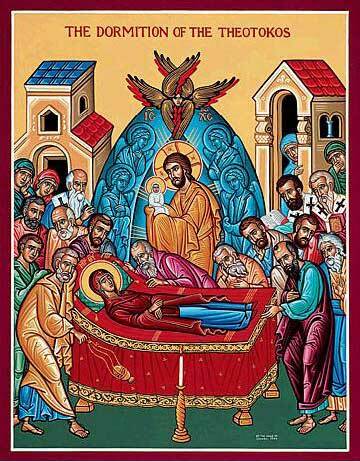 The feast of the Dormition is a second Pascha, a passage from death to life, because we believe that Mary, like her Son, has passed through death and like Him she has risen body and soul. This icon expresses the hope of every Christian who waits for the hour of death as the passage into new life, because of the victory of the resurrected Christ. Each death is a new and personal Pascha. In preparation for the feast, a two-week fast is prescribed (little practiced nowadays). Historically, the Fast of Dormition can be traced to the 9th century but it was officially introduced into the Byzantine Church in the 12th century. According to an old custom, flowers and medicinal herbs are blessed after the Divine Liturgy on the Feast of the Dormition. According to traditional belief, after Mary’s assumption, her tomb was filled with a “heavenly fragrance” and flowers. The herbs, used as natural medicine, are blessed in commemoration of the numerous healing and extraordinary graces bestowed on the pilgrims at Mary’s tomb. The origin of the feast is connected with her public veneration since the fourth century. The solemn proclamation of Mary as the “Theotokos” at the Council of Ephesus (431 A.D.) greatly enhanced her public veneration. At the beginning of the 6th century, a basilica was built over the tomb of Mary in Gethsemane. The feast of Mary celebrated on August 15 took on a new meaning and became the solemn celebration of her death and assumption under the name of the Feast of the Dormition. The solemn celebration of the feast was extended to the entire East during the 6th century. In the middle of the 7th century, the Feast of the Dormition was introduced to Rome where it gradually spread to the Western Church. In the 8th century, the Western Church changed the name of the feast to the Assumption of the Blessed Virgin Mary. The feast of the Dormition is one of the 12 major feasts of the Eastern Church and is celebrated with great solemnity. The Gospel read at the Divine Liturgy of Dormition is the same that is read at all the feasts of the Mother of God. This Gospel reading reminds us that we must venerate the Mother of God not merely for her motherhood, but above all because she carried out the will of God. She responded to God freely and faithfully. The Tropar and Kondak express our belief in the resurrection of Mary. She is in heaven but she is always present with us. She appears to saints, sinners, protects the poor, heals the sick and comforts the afflicted. O Mother of God, in giving birth you still preserved your virginity; and in your falling asleep you did not forsake the world. You are the Mother of Life and have been transferred to life, and through your prayers have delivered our souls from death. The grave and death did not detain the Mother of God. She prays perpetually and is our unfailing hope of intercession; for He who dwelt in the womb of the ever-Virgin, transferred to life the Mother of Life. Place an icon of the Dormition in the icon corner. Decorate the corner with flowers. Process with flowers to the icon corner or have the children bring flowers from home. Say a prayer of blessing and then invite the children to take them home to put in their prayer corners. Explain the meaning of the feast of the Dormition and then have the children colour an icon. Learn to sing the Tropar and Kondak of the feast or learn a new hymn to Mary. Take flowers to church to be blessed by the priest.